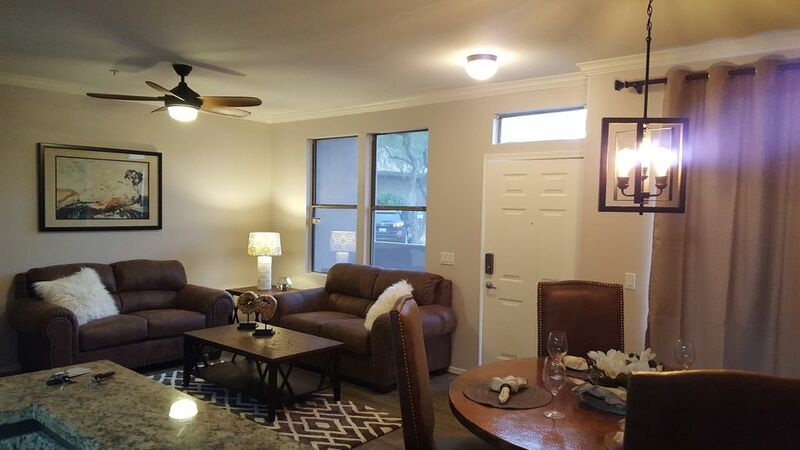 2 Story, 3 bedroom, 2.5 bath condo in desirable north Scottsdale neighborhood. Fully furnished with all the amenities you could need. Available for 3 month or more lease. Please contact owner for available dates. The condo features brand new stainless steel appliances, microwave, dishwasher, Keurig coffee machine, flat screen tv's in every room with cable tv, high speed internet, dual zone wine fridge, 2 Queen sized beds, 1 King sized bed, 2 extra blow up mattresses, extra linens and blankets, washer and dryer, iron/ironing board, hair dryers in each bathroom, gas fireplace, built in desk, and lg patio.